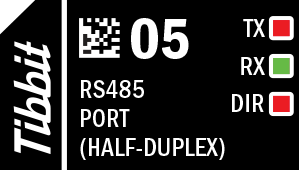 This port has only +/-RX and +/-TX signal pairs. If you are working in the half-duplex mode, connect +RX to +TX, and -RX to -TX. This will allow your system to communicate over a single twisted pair. Direction control is through the RTS line -- the line shall be LOW for data input and HIGH for output. Keep the RX and TX pairs separate for the full-duplex mode and set the RTS line HIGH to keep the TX enabled at all times. For "normal" RS485 applications, this Tibbit has to be connected to the TX and RX lines of the CPU's UART (see [SER]). The original version of this Tibbit made no use of IO3 and IO4. Revision B of the device now provide 5V power on IO3 and GND on IO4. There are three LEDs: two red and one green. Red LEDs are connected to TX and OUT/-IN lines. The green LED is for the RX input. All LEDs are buffered (with logic gates) and light up for the LOW state of control lines. Revision B devices are marked by a small round sticker with letter "B". The sticker is on the side of the Tibbit.